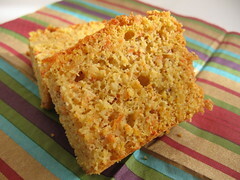 Hazelnut-Carrot Loaf Cakes - Do You Know The Muffin Man? Notes: This one's got a lot of steps: skinning and grinding almonds and hazelnuts, grating and drying carrots, steaming and pureeing more carrots, whipping egg whites! My loaves didn't rise very much, perhaps I deflated it too much while incorporating the whites into the very dense batter. The taste flips back and forth between orange and hazelnut. It's spongy yet moist, an interesting cake I'll remember as a way to use up egg whites and carrots.